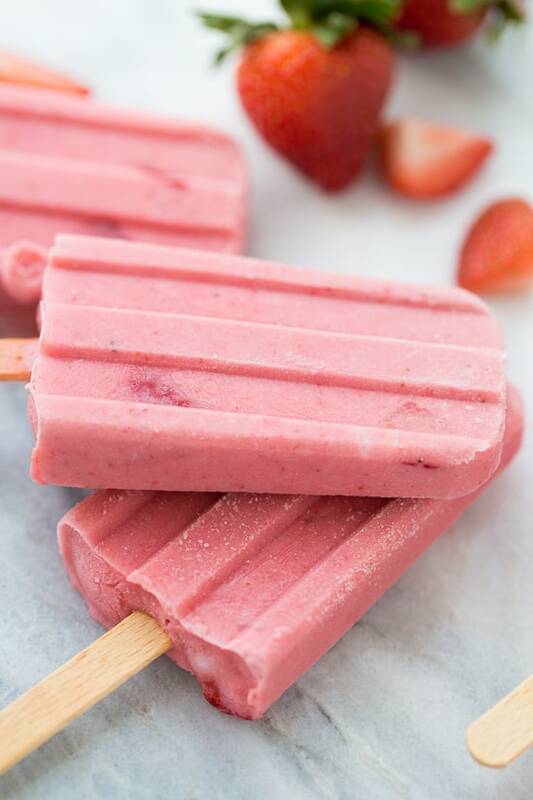 4-Ingredient Strawberry Yogurt Popsicles! Made of fresh strawberries, coconut milk, yogurt (I use dairy-free!) and honey. 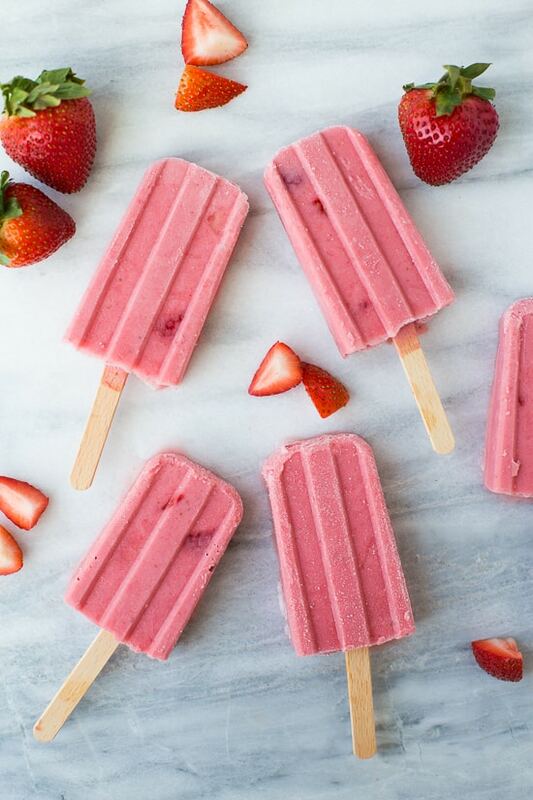 The perfect, refreshing summer treat! 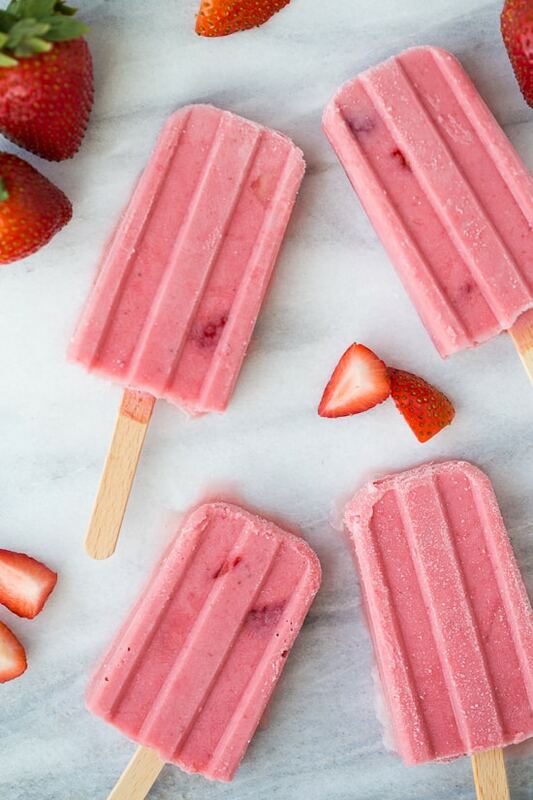 We’re on a popsicle kick over here that can’t be stopped! My 5-year-old son and I love making healthy popsicles together. We eat them on our front porch while the baby is napping for “Mommy- Scott time” as he calls it or for a treat at the end of the day. I love these summer days with my boys! I feel like in the back of my mind I’m always painfully that kids grow up so fast. Sometimes I want to bottle them up just the way they are so we can eat popsicles on the porch forever. At the same time it is such a joy to watch them grow into amazing little people. My older son will be starting kindergarten this year?! Still crazy to me! 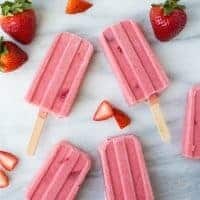 These strawberry yogurt popsicles are so creamy and refreshing! They are made with a whole container of strawberries, coconut milk, yogurt (I use Kite Hill dairy-free yogurt, but any kind will work), and honey (sub maple syrup for vegan). 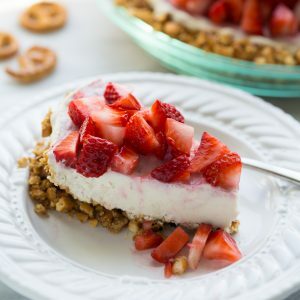 I like to leave a few strawberries whole and mix them in for contrast in texture and a little pop of color. 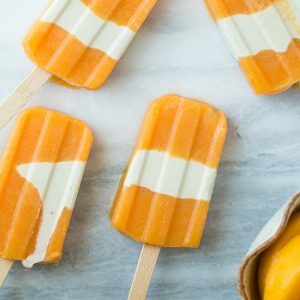 Like with these 3-Ingredient Peach Creamsicles, I use this this popsicle mold (and these wooden popsicle sticks) to make all our popsicles and it works great. You just blend up all the ingredients and pour them into the molds so it couldn’t be easier! Wash and remove the stems on the strawberries. Finely dice 1/2 cup of the strawberries and leave the rest whole. 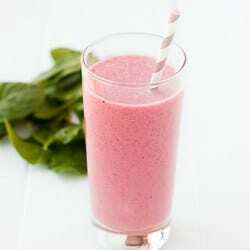 Place the whole strawberries in the blender with the coconut milk, yogurt, and honey. Blend until smooth. Stir in the diced strawberries. Pour into a popsicle mold and add the sticks. Freeze for at least 6 hours, until solid. These look so yummy and so easy to make. I’ve been eating dairy free for about 2.5 months, and I’m interested in trying Kite Hill dairy-free products. 🙂 What stores have you found them at? I have only found Kite Hill products at Whole Foods so far! I live about an hour away from my closest Whole Foods so I always stock up when I’m there. This recipe would also work with another kind of dairy-free yogurt like coconut milk or soy milk yogurt. Thanks, Erin! We’ve never been to Whole Foods before, but I just found one that’s 30 minutes away, so we might check it out soon. These are gorgeous AND healthy! Winning combo!